Murch kids are covering for us all week! This article is from the June edition of their student newspaper, The Blue and Gold. We have permission to reproduce it here. So life will be different for everyone at our school. While the overcrowded 86-year-old Murch building gets a multimillion-dollar facelift, students will be learning, eating and playing on a University of the District of Columbia (UDC) athletic field. An elementary school on a college campus has its pros and cons. A big advantage is that Murch will be able to use some of UDC’s resources. Students probably will have occasional access to UDC’s gym and outdoor amphitheater, and possibly to the college’s science equipment. A disadvantage is that kids must share the area with college students, a possible safety risk. But Principal Chris Cebrzynski said that the trailer park will be fenced in to eliminate the problem. “If we are positive about this move, it could be a wonderful experience,” said a pre-k teacher, Jacqueline Hines. A tough two years may lie ahead for Murch, but perhaps not much harder than it has been in recent years in its overcrowded building. The planners are trying to make the 40 trailers feel as much like the familiar old building as possible. So, for example, the national flags in Murch’s downstairs hallway will be moved and displayed in the UDC trailer park. station at the entrance to UDC. Or they could take public buses, which stop close to temporary Murch. them to walk to school and back. Many parents may prefer to drive their kids to school. Pick-up and drop-off points will be located on Van Ness Street across the street from the Embassy of the People’s Republic of China. Overall, the class schedules in the trailer park will be similar to the way it has been: learning time, recess, lunch, learning time. There will be a trailer with a full-service kitchen. Most students will get their lunches in the kitchen space and carry them to a cafeteria in a a separate tent. They should enjoy eating together, except that PE will take place in the same tent. Pre-k kids are expected to eat in their classrooms. The location and size of play spaces for Murch students aren’t entirely clear yet. Pre-k and kindergarten kids will have their recess in an existing playground that is close to the classroom trailers. 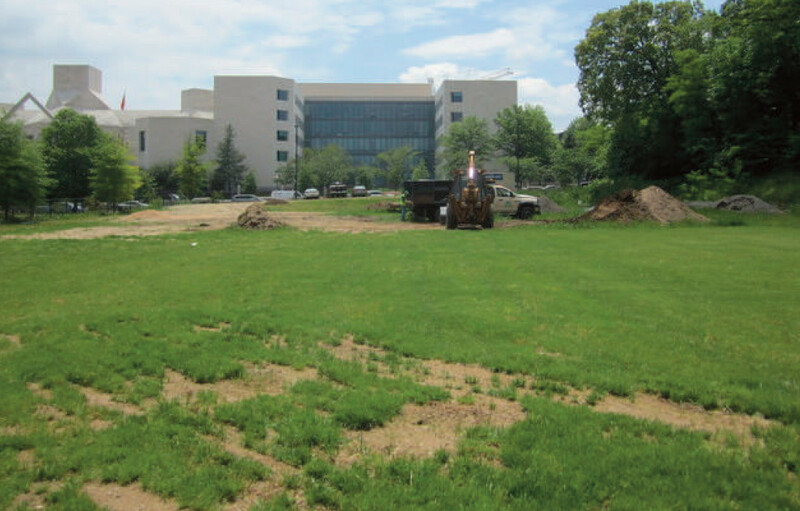 UDC wants to install a turf soccer field in a large open space next to the trailers. When it is completed, Murch students could play there. Until then, they would have access to a small existing playground and possibly the UDC gym during school recesses. Club activities and after-school programs are expected to be unchanged, although the details haven’t been worked out yet. Q: How big will the classrooms be? A: Each classroom will be about 800 square feet, or about the size of the current 3rd-grade classrooms at Murch. Q: How will the trailers be furnished? A: Most of the existing Murch furniture and rugs are expected to be moved into the trailers. Q: What technology will be in the classrooms at UDC? A: The school district plans to install a SmartBoard in each classroom. The entire complex will be connected with a public address system and computer network The computers now used at Murch will be moved into the trailers. Q: Will there be a library with books? Q: Will each resource class have its own classroom? A: There will be an art and a music room in the trailer complex. Spanish will be taught in the grade-level classrooms as it is now. There will be PE classes in a gym “bubble” or possibly in the UDC gym. Q: Will all walkways be covered? Q: Will bathrooms be in the classrooms or in separate areas? A: A combination of both. The pre-k and kindergarten classrooms will have a bathroom inside each of their classrooms. Students in older grades will have multi-user bathrooms. Separate bathrooms will be available for staff members and adult visitors. Q: Will there be a lane for parents to drop off children at UDC? A: Yes. Safe drop-off and pickup areas close to the campus will be chosen soon. Q: If students take the bus, how much will their day be lengthened? A: The distance between Murch and UDC is short, so the ride isn’t expected to add much time. Q: Will students be considered tardy if the bus is late? Q: Who will provide supervision on school buses? A: The driver and an adult aide.